One other thing. I went over Pierre's measurements but in a different way - by using the scale at the foot of the map; I measured the 150 feet in the scale as 25cm so that 1cm = 6 feet. From that, my own measurements all pretty much corresponded with Pierre's except that I measured 13 Miller's Court as being 1.5cm by 2.5cm which in real life would correspond to 9ft by 15ft, as against Pierre's 9.3ft by 17.6ft. I also made it 5cm from the end of Mary's room to Dorset Street, i.e. 30ft for the entire length of the building (which matches Pierre's 9.27m or 30.4ft). I have been wondering if 26 and 27 served as a single unit at one time. What are those passageways above the arch called? Does 'that' connect 26 to 27? I've been wondering that too. That way, one stairwell could service both 26 and 27, leaving more room for profit-making rooms to rent. But it would need a passage between the two on each floor, and I think that only the 1st floor has one, if that's what it is. I too got the door width as 4'2" which I also thought was very wide for a door. Also the door symbol on the map suggests an outward opening door. Unlikely in a 2'10" passage. What 'pierre' sees as a doorway is some sort of weird aberration on the part of the map-maker signifying nothing. Thanks Stephen. The pleasure that the thought of Pierre going into meltdown when he realises his door does not exist is only slightly tempered by a nagging doubt that the mapmaker would include such a clear symbol on the map which represents nothing. But I'm happy to leave it all for Richard to work out! "But I'm happy to leave it all for Richard to work out!" So, where along that passage is 'Prater's Door'? Is there ANY reliable map/plan etc that explains this? David Orsam. Did you see the pics that i posted on Page 10? They indicate, i believe, the staircase door under the arch by Marys room. I was hoping th murder of Kitty Ronan might shed some light on the upstairs room layouts. Interested where your gate idea might lead. Wasn't Kitty was killed in no.12, which I thought was the top floor of the cottage opposite the windows of no.13? If doors and windows are not shown on the map, and maybe the door in the alley is not a door; can we be sure that the Phantom partition door, which shown on the map is actually there! Well here are mine, David. To start with, the Goad Maps do not show doorways. This is true in some cases, there are other plans which do show windows. 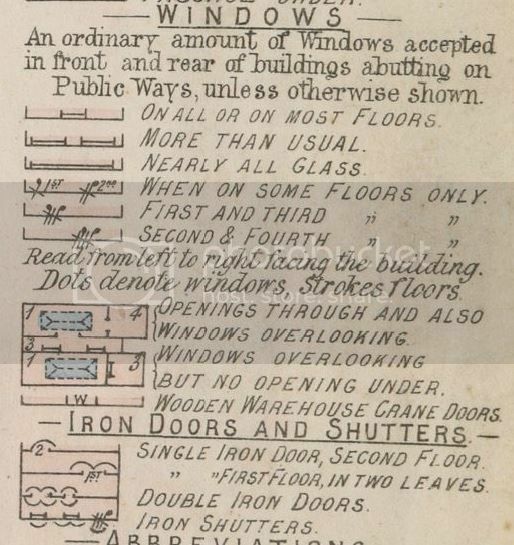 Superficially, it appears windows were shown on properties in the more wealthier parts of town. Front & rear doors are not shown. What that symbol is, is actually a notation. It says "1st", which indicates an opening in the wall on the first floor. You will notice there is no notation for 'ground floor' in these insurance plans. The first floor is the ground floor. Hello Joshua Rogan. Its more based on the idea that reports of the other Miller Courts murders may describe the layout of No. 26, seeing if any info can be mined there too. I think Kitty Ronan was murdered in an upstairs room, but i dont know if it is the one directly above or not. Will have to read the Lizzie Roberts reports now also. Do the thick black lines that border No 26 and 27 on the Goads map mean anything? With the presence of a shared court, i wondered if the house was once one complete unit. At this point, its vague speculation but i believe the Hanbury location may have had a near-similar setup, where one house served as the cats meat shop and the ground floor in the house next to it was a parlour(?) or salon. It could be that no 27 ground floor may have been the kitchen (now chandler shop) and no 26 was a shed/parlour/etc. What were all the modifications miller did to his property in order to turn it i to housing (if it was turned)? Do the thick black lines that border No 26 and 27 on the Goads map mean anything? This portion of a legend may help identify windows and wall openings. To start with, the Goad Maps do not show doorways. Here is your "weird aberration" and beside it you also find the explanation for the "weird aberration", although it is "meaning nothing". Last edited by Pierre; 12-15-2015, 06:42 AM. Interested where your gate idea might lead. There was no gate. The windows on 26 Dorset Street was boarded up according to The Evening Express. And look at Goad´s Fire Insurance Plan.